The paper in Nature Communications is here: https://doi.org/10.1038/s41467-018-06673-5. For me it all started with a telephone call, sometime in 1984, from Joop Jukema, a farmer and specialist potato grower. Joop was (and still is) a licensed bird ringer, and in 1984 he had just mastered catching staging bar-tailed godwits Limosa lapponica on the Frisian shores of the Wadden Sea, The Netherlands, not far from his coast-side farm. He used a traditional, artisanal, netting type called ‘wilsternet’, a large pull-net pushed by the wind, to capture Eurasian golden plovers Pluvialis apricaria in flight as they try to land among a group of decoys (1). By mimicking the flight calls of the godwits on a traditional whistle, and by making adjustments to his decoys, Joop managed to lure bar-tailed godwits coming into a grassland polder for supplementary feeding during high tide, towards his net and catch them. In May 1984, the first spring season, he captured many hundreds. Joop had realized that during the planned Dutch shorebird expeditions in 1985 and 1986 to the Parc National du Banc d’Arguin in Mauritania, that he had heard about and that I was involved in, we might be catching and marking the very bar-tailed godwits that he just mastered to study during northward staging in the Dutch Wadden Sea. He suggested we should align our research efforts. We did, and after the fieldwork in March-April 1985 at Banc d’Arguin, I joined Joop during several catching days in May on the Frisian foreshore. Life has never been the same. At the time we knew next to nothing about the migrations of our bar-tailed godwits, but we believed Dutch staging godwits to breed on the north central Siberian tundra and to winter somewhere along the West-African coast. With more than half a million bar-tailed godwits counted by us on the Banc d’Arguin in 1980 (2), such direct connections between Mauritania and The Netherlands seemed the first thing to actually demonstrate. In March and April 1985, at Banc d’Arguin we dyed the under-tails of captured godwits yellow with picric acid. This would enable resightings within that season at the site of capture and further along the migration route. On two occasions such colour-marked bar-tailed godwits were resighted at our Dutch study site. The first was of a bird in flight as it managed to escape Joop’s ‘wilsternet’ on the Frisian coast on 9 May 1985, a few weeks after its release in Mauritania. The second was a sighting on 18 May 1985 of the same or another individual. Subsequent analyses showed that the timing of departure from Mauritania nicely matched the timing of arrival in the Dutch Wadden Sea a few days later. The body dimensions of godwits captured in Mauritania and the Wadden Sea were identical, but they had rather different body mass change trajectories in Mauritania and The Netherlands. In the Wadden Sea, staging bar-tailed godwits fuelled up much faster than earlier in spring on the Banc d’Arguin (3). As we Dutch started to publish the findings in 1990 –whilst trying to maintain the series of observations, especially the yearly catching in May– fully independently our Russian colleagues started monitoring nesting shorebirds on the tundra of central and east Taimyr from 1992. The work included observations on the spring arrival of bar-tailed godwits, their nesting and the emergence of the imagos of crane flies Tupila. These relatively long-legged, poorly flighted insects form the staple food of bar-tailed godwit chicks. A coincidence of history, first author Eldar Rakhimberdiev was a member of the Russian field teams as masters and then a PhD student in 2000-2006 (4). He would never have dreamed of the data collected then being such a critical part of the assessment of the changing phenology of migration by godwits during a phase of rapid advancement of spring snow melt on the Siberian tundra. In 2012, Eldar, by then an experienced postdoc researcher, moved to my group at the NIOZ Royal Netherlands Institute for Sea Research on the island of Texel to help us with the analyses of the demography and migrations of red knots Calidris canutus (also linking Mauritania and Siberia with a staging period in the Wadden Sea (5,6)) and bar-tailed godwits. Bringing sophisticated analytical techniques to the table to weave together the many relevant long-term time-series (including measurements on the densities of the Wadden Sea staple for bar-tailed godwits, the lugworms Arenicola marina, collected by NIOZ researchers since the 1970s), Eldar created a robust network of descriptive relationships during a time of a ‘natural experiment’: the rapid warming of the Siberian Arctic especially. On 5 January 2017, Nature published a review by Margaret Munro (7) on ‘What’s killing the world’s shorebirds?’ It makes important points. First of all, it laments the loss of our migratory shorebirds and says that “Although the trend is clear, the underlying causes are not. That’s because shorebirds travel thousands of kilometres a year, and encounter so many threats along the way that it is hard to decipher which are the most damaging.” It continues to say that “The challenge is to identify the most serious problems and then develop plans to help shorebirds to bounce back.” That this work is inherently difficult to achieve is made clear in a comment by our Canadian colleague Paul Smith: “It’s inherently complicated — these birds travel the globe, so it could be anything, anywhere, along the way”. Our paper now published in Nature Communications, in fact is the answer to Nature’s concern that “there is a huge need to understand how different threats and disturbances impact shorebird survival… be it insect abundance in Alaska and Russia or the destruction of feeding grounds and refuelling stops caused by coastal development in the tropics and midlatitudes”. In our analyses of the time-trends in migration phenology and refuelling rates of the Siberian-breeding bar-tailed godwits, we show that migratory populations may actually be limited by factors that combine the circumstances at more than one location. In the case of the godwits, climate warming in the Arctic increases the birds’ dependence on the food conditions in temperate staging areas. The capacity of birds to be flexible and cope with these changing conditions should perhaps not come as a surprise (8). However, the high rates of habitat loss at critical temperate shorebird staging areas in some parts of the world is cause for great concern (9). As a bonus, this paper goes against the trend identified by Nature on 3 April 2014 in an editorial called ‘Natural decline. Few biology degrees still feature natural history. Is the naturalist a species in crisis?’ Our paper seems rather unique in connecting the ecological dots over several decades along a whole flyway for a species that is in jeopardy. In fact, it also comes with a novel suggestion. We propose that the use of multiple sites in the course of the year (by migratory birds), rather than being a liability can actually have advantages. It gives these animals (and the people trying to ‘manage’ their populations) the scope for mitigation of a kind not earlier envisaged. Sure, the evidence is correlative, as it always will be with climate-related reconstructions of mechanisms on relevant global scales. The natural history observation routines on which we have based our report are notoriously difficult to maintain on a long-term basis. This is caused by short-term funding cycles and the lack of status of ‘natural history’ as a premier science to understand our rapidly changing planet (10). I hope that our paper helps establish political will to continue such observations. We should realize that, despite its key value, we cannot just rely on the thousands of hours of unpaid labour by keen amateur bird scientists such as the meanwhile retired potato farmer Joop Jukema. (1) Piersma, T., Rogers, K.G., Boyd, H., Bunskoeke, E.J. & Jukema, J. (2005) Demography of Eurasian golden plovers Pluvialis apricaria staging in The Netherlands, 1949-2000. Ardea 93, 49-64. (2) Engelmoer, M., Piersma, T., Altenburg, W., & Mes, R. (1984) The Banc d'Arguin (Mauritania). In P.R. Evans, J.D. Goss-Custard, & W.G. Hale (Eds. ), Coastal waders and wildfowl in winter (pp. 293-310). Cambridge: Cambridge University Press. (3) Piersma, T. & Jukema, J. (1990) Budgeting the flight of a long-distance migrant: changes in nutrient reserve levels of Bar-tailed Godwits at successive spring staging sites. Ardea, 78, 315-337. (4) Rakhimberdiev, E., Soloviev, M., Golovnyuk, V. & Sviridova, T. (2007) The influence of snow cover on selection of nesting grounds by Charadrii waders in southeastern Taimyr Peninsula. Zool. Zhurn. 86, 1490–1497. (5) Rakhimberdiev, E., van den Hout, P.J., Brugge, M., Spaans, B. & Piersma, T. (2015) Seasonal mortality and sequential density dependence in a migratory bird. Journal of Avian Biology 46, 332-341. (6) van Gils, J.A., Lisovski, S., Lok, T., Meissner, W., Ożarowska, A., de Fouw, J., Rakhimberdiev, E., Soloviev, M.Y., Piersma, T. & Klaassen, T. (2016) Body shrinkage due to Arctic warming reduces red knot fitness in tropical wintering range. Science 352, 819-821. (7) Munro, M. (2017) What’s killing the world’s shorebirds? Nature 541, 16–20. (8) Piersma, T. & van Gils, J.A. (2011) The Flexible Phenotype. A Body-centred Integration of Ecology, Physiology, and Behaviour. Oxford: Oxford University Press. (9) Piersma, T., Lok, T., Chen, Y., Hassell, C. J., Yang, H.-Y., Boyle, A., Slaymaker, M., Chan, Y.-C., Melville, D. S., Zhang, Z.-W. & Ma, Z. (2016) Simultaneous declines in summer survival of three shorebird species signals a flyway at risk. Journal of Applied Ecology 53, 479–490. (10) Wikelski, M. & Tertitski, G. (2016). Living sentinels for climate change. Science 352, 775-776. Photo 1. Theunis Piersma (left) and Joop Jukema on a net with captured bar-tailed godwits in May 1991. Unknown photographer. Photo 2. 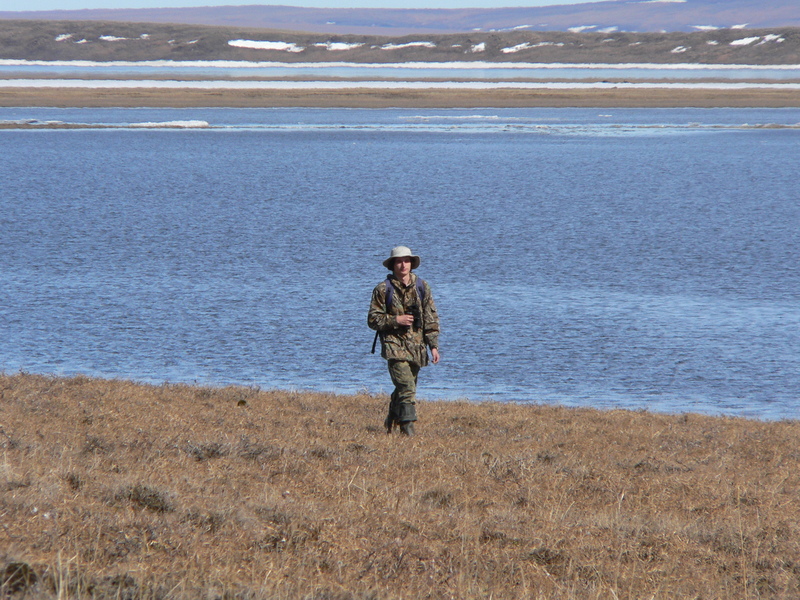 Eldar Rakhimberdiev in search for the first shorebird nests at Lake Taimyr, 23 June 2005 (74°N, 100°E). Photo by Mikhail Soloviev. Photo 3. 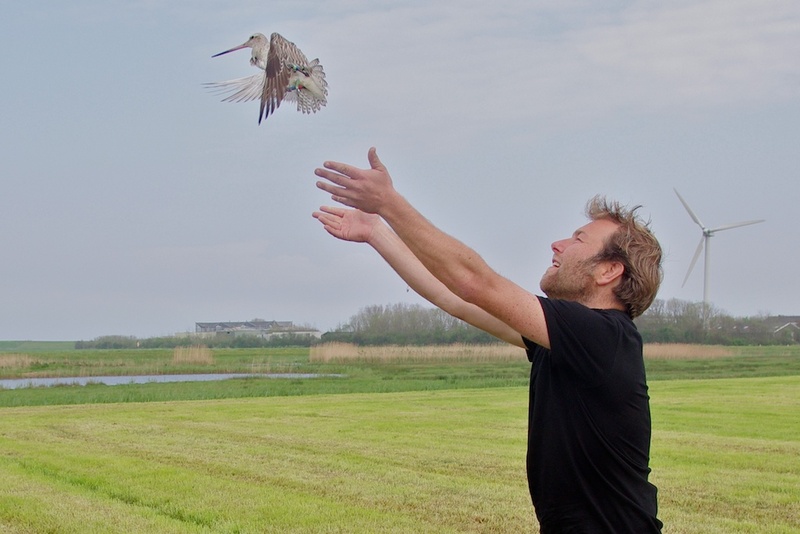 Co-author Job ten Horn releasing a freshly captured bar-tailed godwits, now with known biometric details and individualized with a set of colour-rings, on the Wadden Sea island of Texel in May 2016. Photo by Rob Buiter.